We provide Wasp Nest Removal Services in New York NY, Westchester Country NY, Rockland County NY and Orange County NY. We offer Same Day Wasp Removal. Let Us Be Your Wasp Exterminator, Give Us A Call Today. 1-844-305-8999. We Specialize in the Removal of all Stinging Insect Nests and Hives. 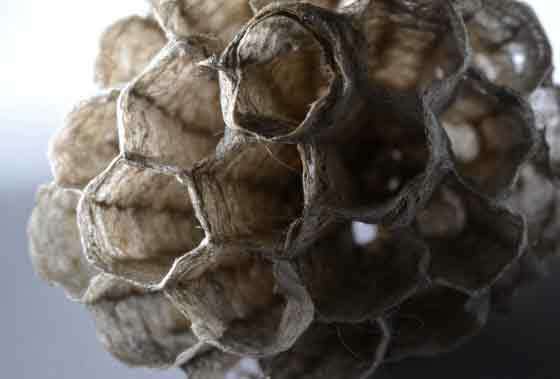 Wasp nests are made of a substance similar to paper that the insects produce by chewing wood into a pulp and then sticking it together with saliva to form a honeycomb-type Nest. They are located within or atop trees, in attic rafters and in other covered areas. The type of treatment can vary from quick acting knockdown pesticide spray to long lasting residual insecticide dust. The long-lasting insecticide dust is applied into the openings that the Wasps used to enter their hive. The insecticide dust penetrates deeper into the Wasp Nest then an ordinary pesticide spray would. Additionally, the dust is transported deeper into the hive by other Wasps entering. This will allow our Stinging Insect Exterminator to perform the Hornet Nest Removal in a safe manor. 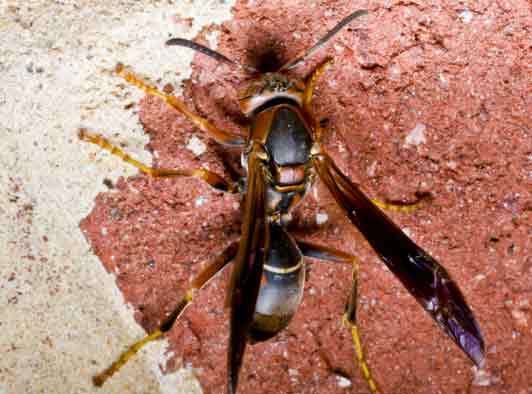 When Wasps build a nest in your home our Trained Stinging Insect Technicians are experts in Wasp Nest Removals. 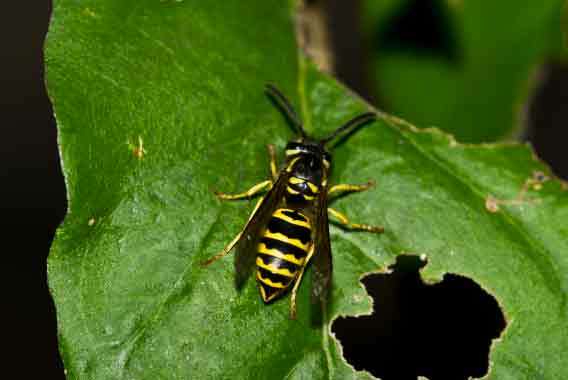 Wasp Hives are easily identified on the exterior of the home. The timing of the treatment is important to ensure that all of Hornets are eliminated at the same time. 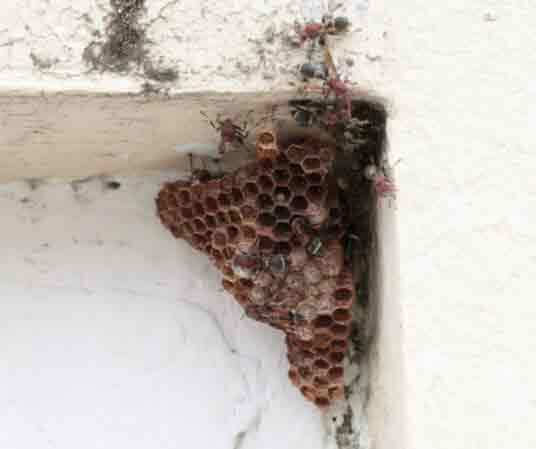 A typical mistake by home owners is applying a pesticide to the exterior of a Wasp Nest. This may kill a few wasps however, the majority will survive and subsequently become more aggressive in defending their home. 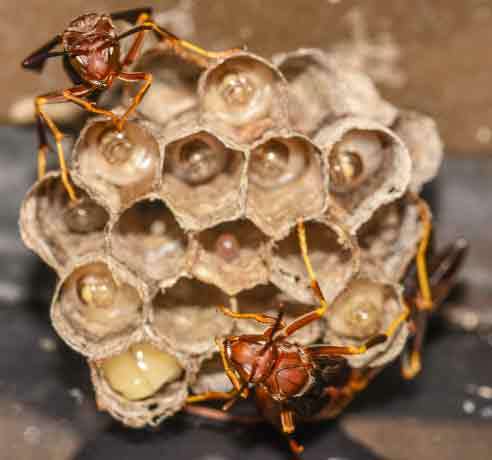 Paper Wasps are protective and will sting repeatedly if their nests are disturbed. Our Stinging Insect Technician will do a Thorough Inspection of your Home and Property and remove any Wasp Nest you may have. 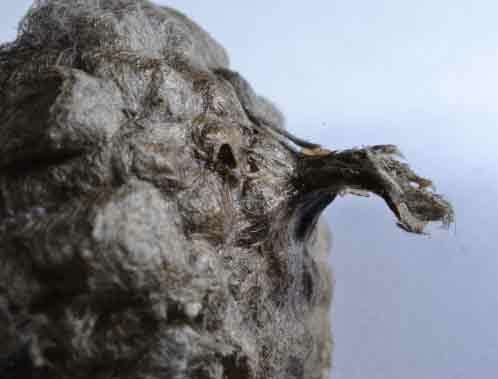 If the Wasp Nest is found inside your home we will perform a Treat and Seal (Remove the Wasp Nest, Seal Openings).